With an expanded, two-day format, attendees will have an opportunity to hear what is on the mind of the wealth owner, explore leading trends in investing, and engage in speed networking with investment managers. There will be ample opportunity for FOX investors to meet and share their thinking across topics of common interest with peer exchange sessions at the Forum and curated social events for members. Ten years after the global financial crisis, investment markets are at a critical point. Volatility has reemerged in this late stage of the economic cycle, triggered by what appears to be decelerating growth in the United States and across the globe. Policy actions and the “noise” of 24/7 news generate outsize market reactions. Professor Adam Tooze will kick off the Forum, presenting from his recently published book, Crashed: How a Decade of Financial Crises Changed the World. With the backdrop of continued market uncertainty, family offices are forging their own path. This Forum will highlight sophisticated family office leaders who are committed to less conventional investment approaches. A real estate industry expert, Douglas Poutasse, will share economic research and discuss risks and opportunities for late stage real estate investing. PIMCO’s Libby Cantrill will discuss global challenges to investors through a political and economic lens, including the rise of populist movements and challenges to democratic institutions around the world. Breakout sessions will focus on various direct investing topics, as well as topics for those that delegate to external managers/advisors. An exciting new format, Speed Dating for Managers, will allow attendees to learn about several interesting investment strategies. Registration for the 2019 FOX Global Investment Forum is now closed. Please email events@familyoffice.com with inquiries about this event. Registrations are subject to approval by FOX. 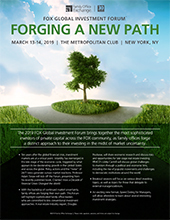 Registration for this event is for family office and investor members of Family Office Exchange and qualified prospective members who have an interest in investment decisions for the family or family office. FOX Advisor members may send an appropriate senior-level investment person. Field of Study: Finance - Up to 8.5 CPE credits can be earned by attending this event. CPE credits are accepted at the option of state certifying boards. Requirements, compliance procedures and acceptance may vary by state. Learning Objectives: Upon completion of the program, participants will gain an understanding of the current implications of the decade-old global financial crisis, a macroeconomic outlook for investment markets through a policy and political lens, the opportunities and risks in real estate and other asset classes, as well as more information on family offices and direct investing.